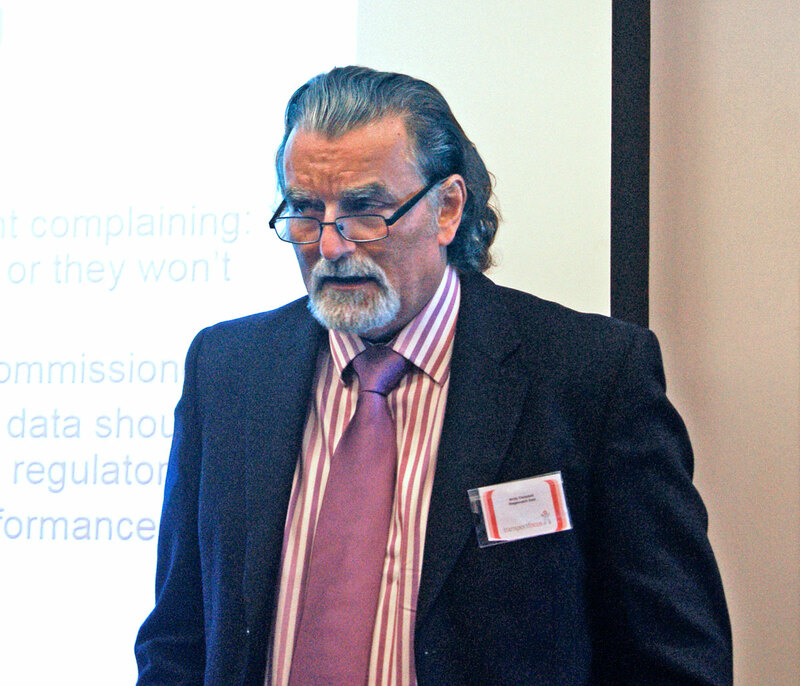 Industry watchdog, Transport Focus, has held a series of seminars following the launch of its recently published report, ‘What’s the Hold Up? Exploring Bus Service Punctuality’. 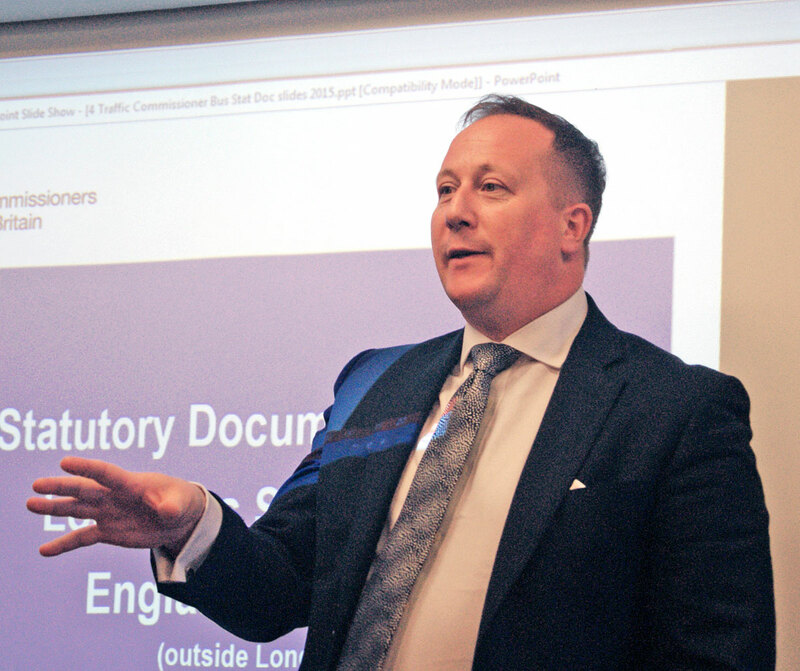 They saw operators and Traffic Commissioners speak on punctuality. Chris Peat attended the Cambridge event. First to speak was Bus Policy Advisor at Transport Focus, Mike Bartram, who went into some depth on the punctuality report. The study looked at rural and urban routes, working closely with a range of operators, including Arriva, Go North East, National Express, Stagecoach, trentbarton and Countrybus. The report found delay was associated with boarding and alighting, with different types of passenger taking longer, or the number of passengers having an effect. Some customers may need help with fares and tickets, adding to the time. Inadequate recovery time proved to be a recurring theme, with Mike saying setting a timetable to reflect varying traffic conditions is a particularly challenging task. This is compounded by the ever increasing traffic on the roads. Roadworks were also commonly seen to hold buses up. During the questions session at the end, one operator noted his experience of local authority vagueness when it came to notifying when work would take place. Different driving styles amongst drivers also played its part it was found. Variation between drivers lead to timing discrepancies of as much as ten minutes, according to the report. The buses used affected punctuality, for instance, it was found older vehicles took longer to go up hills. Bus design played its part in this too, with single door buses spending more time at stops compared to double door variants. The report raised issues about parking enforcement on the roads, notably parked cars and taxis blocking paths. Surprisingly, bus stations were found to negatively affect punctuality in some cases, with queues to get out proving time consuming. Timetables were seen by passengers as a ‘guide rather than a promise’, with customers preferring a more accurate, yet less easy to remember timetable than a less accurate, easier to understand one. Passengers were seen to distinguish between poor punctuality and delays. 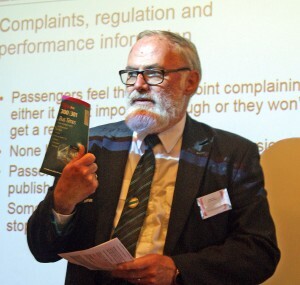 Mike said that a Transport Focus report in 2010 found half of complaints made to bus companies did not receive a reply and very few passengers knew of the Traffic Commissioners and their role. Following this rundown of the recent report, Andy Campbell, Stagecoach East MD, gave a case study on his operation’s 13 route between Haverhill and Cambridge, which last year was upgraded to the company’s premium Gold service. The result of the change was significant growth in patronage, partly due to free travel during the first few weeks, but since then growth has been at 2% to 3%. The route had to be changed to cope with traffic, with a short section taken out to help it maintain its frequency. ‘From my point of view, things have only got worse,’ said Andy on the subject of the roads and traffic. Following Andy was Simon Archer, Registrations and Service Compliance Manager, Arriva the Shires. 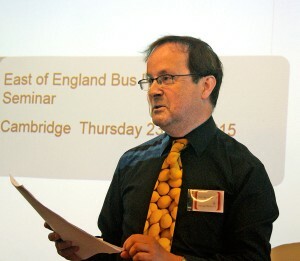 His case study focused on his operation’s 300/301 timetable between Hemel Hempstead and Stevenage. Simon claimed one of the challenges of punctuality is the variance of traffic. On the 300/301, weekday journey times at 16.00 were two hours 16 minutes, whilst at the same time on a Sunday it was one hour 38 minutes. The difficulty of waiting at stops to ensure punctual running is that the route connects train stations and passengers will be frustrated and put off using the service if there is too much hesitation when they are anxious to board their train. The 300/301 suffers from traffic in overlapping sections. How it can be improved has been looked at since 1976, yet Simon says there is nowhere it can be split except in overlapping sections. Road designs can contribute to punctuality problems, he said. He gave the example of a zebra crossing in St Albans that caused traffic hold ups. He fought long and hard and eventually won to have it changed to a pelican crossing, resulting in less congestion. Where a service is allocated in a bus station can have an affect, according to Simon. He gave a few examples of this from his time in the industry. Simon also mentioned different drivers having an affect on punctuality, with inexperienced ones sometimes taking longer. Using automatic vehicle location (AVL) technology can help punctuality, but Simon emphasised some problems. One instance saw buses were running to timetable on screen, yet passenger complaints were still coming in concerning buses not arriving. He found some of the vehicles were displaying a ‘Not in Service’ display on the destination boards, so they ran unhindered and on time but without any passengers. Richard said there is an acceptance of the difficulties operators are under, but he is going to take complaints seriously. He said the gathering was no doubt aware of proposals to revise the window of tolerance for punctuality, something that has now been ‘through the mill’ and come back as the same as it was previously. Richard said the list of reasonable excuses in the published guidance is not an ‘exhaustive list’. He said Beverley Bell, Senior Traffic Commissioner, has slimmed this information down and made it a more ‘definite statement’. Richard mentioned that Beverley Bell had put a reminder in the guidance document for operators to cooperate with regulators and the enforcement agency. He believed communicating with local authorities was important for all, and advised operators to not just try once and give up.